HÀ TĨNH — Dozens of ceramic wares dating back up to the 14th century have been unearthed in the central province of Hà Tĩnh. Hồ Huy Muôn, a resident of Thuần Thiện Commune, Cam Lộc District, by chance dug up 12 plates and one bowl while making an irrigation canal in a local field. Lê Bá Hạnh, deputy director of Hà Tĩnh Museum, confirmed that a group of experts from the museum had visited the site and could determine the time period the four plates and the bowl belonged to. 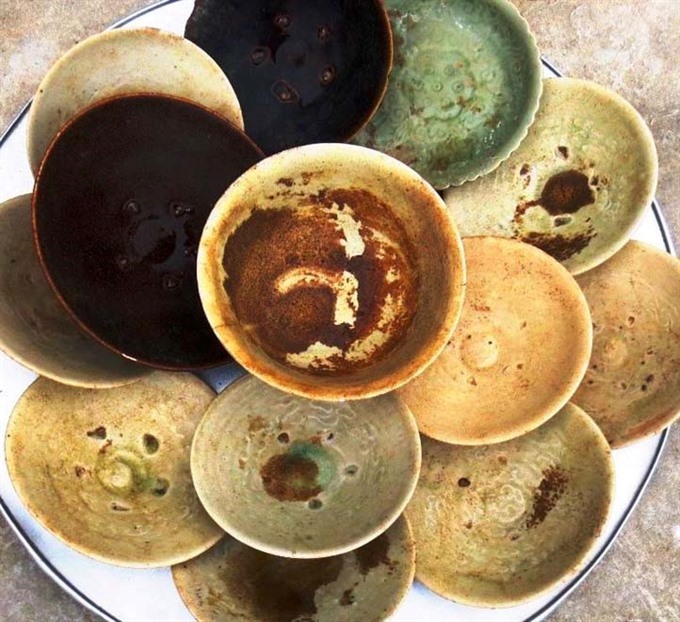 The largest plate is 20cm in diameter and 8cm in height and is covered with a caramel-coloured glaze. Another plate has an engraved lotus pattern in the middle and is covered with a green glaze, while the other two plates have engraved images of clouds in the middle and are glazed in white. “These are typical features of ceramic wares of the late Trần and early Lê dynasties (14th-15th centuries),” Hạnh said.